In simple words, a nicely written book covering aspects in a logical manner. Once you start reading the book, you learn more than expected. The book starts explaining your favorite IDE Visual Studio 2012 making you feel comfortable with itself and then explains memory management and asynchronous programming in a very easy to understand language. The book illustrates each function as a “How To” question answer approach that every developer will find easy to read at. As you go ahead reading the book, you learn new techniques and enhancements for WPF, ASP.Net, Windows 8 Store Apps. The book comprises of 7 chapters with each chapter focusing on one technology and giving you answers of many questions related to the technology. Abhishek Sur is a Microsoft MVP in Client App Dev since 2011. He is an architect in the .NET platform. He has profound theoretical insight and years of hands on experience in different .NET products and languages. His website abhisheksur.com guides both budding and experienced developers to understand the details of languages and latest technology. This book is aimed at any Visual Studio 2012 and .Net developers who want to gain advanced understanding on the technology and sharpen their existing skill sets and adapt to new .NET technologies. This book is good for any developer willing to learn new cutting edge Microsoft technologies. The book explain how to increase productivity of development using a common set of tools and features present inside the IDE. The book has detailed explanation on memory management and related techniques. New Threading Patterns and performance boosters available in .NET 4.5 and VS 2012 with ASP.NET. 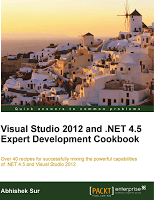 The book also introduction to latest enhancements of ASP.NET 4.5 with HTML5 and jQuery. The book introduces the enhancements to WPF 4.5 and the major components of WPF along with MVVM architechture. The book introduces the new programming model for developing Windows 8 style tiles application and also focuses on how to implement network-enabled applications in Windows 8.